Beginning the new series of catecheses on the Sacrament of Confirmation, in his address in Italian the Pope focused his meditation on Christian witness (Biblical passage from Saint Luke’s Gospel 4:16-18). 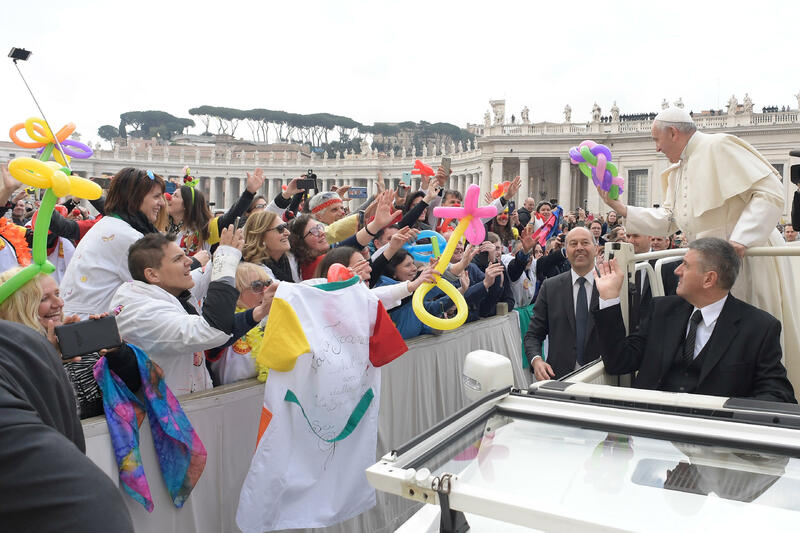 After summarizing his catechesis in several languages, the Holy Father expressed special greetings to groups of faithful present. Then he made an Appeal, inviting to prayer for Catholics in China. After the catecheses on Baptism, these days that follow the Solemnity of Pentecost invite us to reflect on the witness that the Spirit arouses in the baptized, putting their life in movement, opening it to the good of others. Jesus entrusted a great mission to His disciples: “You are the salt of the earth; you are the light of the world” (Cf. Matthew 5:13-16). They are images that make us think of our behaviour, because the lack or excess of salt makes food unpleasant, just as the lack and or excess of light impedes our seeing. He who can truly render us salt that gives flavour and preserves from corruption, and light that illuminates the world is only the Spirit of Christ! And this is the gift we receive in the Sacrament of Confirmation or Cresima, on which I wish to pause and reflect with you. It’s called “Confirmation” because it confirms Baptism and reinforces its grace (Cf. Catechism of the Catholic Church, 1289); as also “Cresima” from the fact that we receive the Spirit through the anointing with “chrism” — oil mixed with fragrance consecrated by the Bishop –, term that refers to “Christ,” the Anointed of the Holy Spirit. The first step is to be reborn to divine life in Baptism; one must then behave as children of God, namely, to be conformed to Christ, who works in the Holy Church, letting oneself be involved in His mission in the world. The anointing of the Holy Spirit provides for this: “without His strength, nothing is in man” (Cf. Sequence of Pentecost). We can do nothing without the strength of the Holy Spirit: it is the Spirit that gives us the strength to go forward; just as the whole life of Jesus was animated by the Spirit, so also the life of the Church and of every member of hers is under the guidance of the same Spirit. Conceived of the Virgin by the Holy Spirit, Jesus undertakes His mission after, coming out of the water of the Jordan. He is consecrated by the Spirit, who descends and remains upon Him (Cf. Mark 1:10; John 1:32). He declares it explicitly in the synagogue of Nazareth: it’s beautiful how Jesus presents himself, what is Jesus’ identity card in the synagogue of Nazareth! Let us listen to how He does it: “The Spirit of the Lord is upon me, because He has anointed me to preach good news to the poor” (Luke 4:18). Jesus presents himself in the synagogue of his village as the Anointed, He who was anointed by the Spirit. Jesus is full of the Holy Spirit and is the source of the Spirit promised by the Father (Cf. John 15:26; Luke 24:49) Acts 1:8; 2:33). In reality, on the evening of Easter the Risen One breathes on His disciples saying to them: “Receive the Holy Spirit” (John 20:22); and on the day of Pentecost the strength of the Spirit descends on the Apostles in an extraordinary way (Cf. Acts 2:1-4), as we know. The “Breath” of the Risen Christ fills the lungs of the Church with life; and in fact the mouths of the disciples, “filled with the Holy Spirit,” open to proclaim to all the mighty works of God (Cf. Acts 2:1-11). Pentecost — which we celebrated last Sunday — is for the Church what the anointing of the Spirit, received at the Jordan, was for Christ, that is, the missionary impulse to consume one’s life for the sanctification of men, to the glory of God. If the Spirit operates in every Sacrament, He does so in a special way in Confirmation that “the faithful receive as Gift of the Holy Spirit” (Paul VI, Apostolic Constitution Divinae Consortium Naturae). And in the moment of carrying out the anointing, the Bishop says this word: “Receive the Holy Spirit that was given to you as gift”: the Holy Spirit is the great gift of God. And all of us have the Spirit within. The Spirit is in our heart, in our soul. And the Spirit guides us in life so that we become right salt and right light for men. If in Baptism it’s the Holy Spirit that immerses us in Christ, in Confirmation it’s Christ that fills us with His Spirit, consecrating us His witnesses, participants in the same principle of life and of mission, according to the celestial Father’s plan. The witness rendered by the Confirmed manifests the reception of the Spirit and docility to His creative inspiration. I wonder: how is it seen that we have received the Gift of the Spirit? <It is seen> if we carry out the works of the Spirit, if we pronounce words taught by the Spirit (Cf. 1 Corinthians 2:13). Christian witness consists in doing only and all that the Spirit of Christ asks us, granting us the strength to carry it out. I’m happy to receive the participants in the General Chapter of the Brothers of the Sacred Heart, the Brothers of the Christian Schools and the Pauline Co-operators. I invite each one to second the voice of the Holy Spirit through concrete good actions. I greet the Clericus Cup Group, the Parishes of Saint Nicholas of Bari at Polvica di Chiaiano and the Pastoral Unit of Castel del Piano Pila of Perugia; the Student Groups, in particular those of the Mary Help of Christians School of Rome; the Faculty of Civil and Industrial Engineering of La Sapienza University of Rome and the Volunteer Fire Brigade of Bondeno. I entrust to Our Lady in particular the young people, the elderly, the sick and the newlyweds that are present here today. I exhort all to value in this month of May the prayer of the holy Rosary. We invoke Mary’s intercession, so that the Lord may grant peace and mercy to the whole world. Tomorrow, May 24, is the annual feast of the Blessed Virgin Mary “Help of Christians,” venerated particularly in the Sheshan Shrine of Shanghai in China. This feast invites us to be united spiritually with all the Catholic faithful that live in China. We pray to Our Lady for them, so that they can live the faith with generosity and serenity, and so that they are able to carry out concrete gestures of fraternity, concord and reconciliation, in full communion with the Successor of Peter. Dear disciples of the Lord in China, the universal Church prays with you and for you, so that even amid the difficulties you are able to continue to entrust yourselves to the Will of God. Our Lady will never be lacking in her help to you, and she will protect you with her mother’s love.